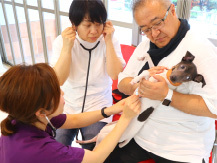 The Happy Dog Program are “vaccinations for the mind”. The Happy Dog Program is “vaccinations for the mind”. It is to prevent behavioral problems of puppies (house breaking, biting, destruction, barking, etc.). Our motto is to “enjoy learning!” We hope to have fun together during the lessons and to have the puppies coming to the hospitals gladly. Prevention of puppy behavioral problems is as important as vaccinations for physical diseases. This is most effective between 2 to 16 weeks of age which is known to be the “socialization period”. How the dogs spend this short period of their early life may alter their future completely. To teach the puppies what appropriate manners are is the responsibility of the owners, their new family. We offer private behavioral consultations to help you with effective training, and formation of a trusting relationship between you and your new furry family. Potential Candidates Puppies under 1 year of age. These are intended for socialization and basic handling of the puppies. But really, our true aim is to have the puppies and their families to like our hospital, because if we can accomplish this, we can minimize the stress and anxieties of your puppy when he becomes in need of treatment or hospitalization. So we focus not just on the methodology which is based on scientific evidences on animal behavior, but also having fun while learning. Don’t fret, just come and play with us! Requirements to Enroll Health checks at out hospital or a health certificate issued (within a week before enrollment) by another clinic and an appropriate vaccination history. Schedule Puppy parties are held periodically with no fixed schedule.